Demolition Parts coming through with a fresh video giving us a look at what Jacman Hinss got into during his recent trip up to the USA from Australia. During his stay he took a road trip from California to Arizona hitting up street spots, skateparks and trails, slaying everything in his path. Hit play and take in plenty of dialed riding! It’s safe to say he had a good time during his trip. “Our Australian brother, Jacman Hinss was in the states this past fall for a few weeks and we stacked some fun clips on various trips and came out with a rad little video. Jacman is all about having a good time, always makes us laugh and is a treat to be around! Enjoy some, smooth, stylish and solid riding from the man down under Jacman Hinss! Demolition Parts have added young gun Adler Cromer to their flow squad! Adler has been throwing down out in Arizona and this video is packed with solid riding from a few parks where Adler brings his speed and style to ramps and bowls. Expect to see more from this kid in the future! Check it! “We’re very excited to announce our newest addition to the flow team, Adler Cromer. Adler’s respectful mannerisms, insane bike control and flow made him a no brainer to rep Demolition. Hailing from Tucson, AZ with the backing of Kevin Peraza and Premises Park as his local, Adler is learning the ropes very quickly and we’re very happy that he’s apart of the family… for now enjoy Adler doing what he does best, from just a typical session and stay tuned for more in the future. The second episode of the Days In The Life of Mike “Hucker” Clark from Demolition Parts continues! This time around Mike spends some time in San Diego hanging out with Dennis Enarson riding and recording a podcast. Hit play and take it all in! Another change for 2019 , I wanna thank @demolitionparts so much for the support of the last 5 years. Also a big thank you to terry at @bmxmilitia for being the legend he is! Much love @demolitionparts ✌🏼✌🏼Swipe across and look at the good times. It looks like Boyd Hilder has decided to part ways with Demolition Parts after leaving Volume for Federal Bikes a few weeks back. Above is his Instagram post where he broke the news. It didn’t mention what he has in the works, but we have a feeling he has something cooking. We would imagine that it will be coming sooner than later. We’ll keep you posted when we hear more! Demolition Parts kicking off the week with a short but sweet video featuring Parker Heath slaying spots and dodging cars around San Diego! Parker is a serious machine and puts his bag of tricks to good work on a bunch of dialed spots. Hit play and enjoy! “Get a quick glimpse of our 20 year old young gun Parker Heath. Street, Trails, Park, you name it, and Parker can ride it with ease. Here’s a minute of some fast paced street footage from our dude Parker. Is it time for a new BMX Seat? 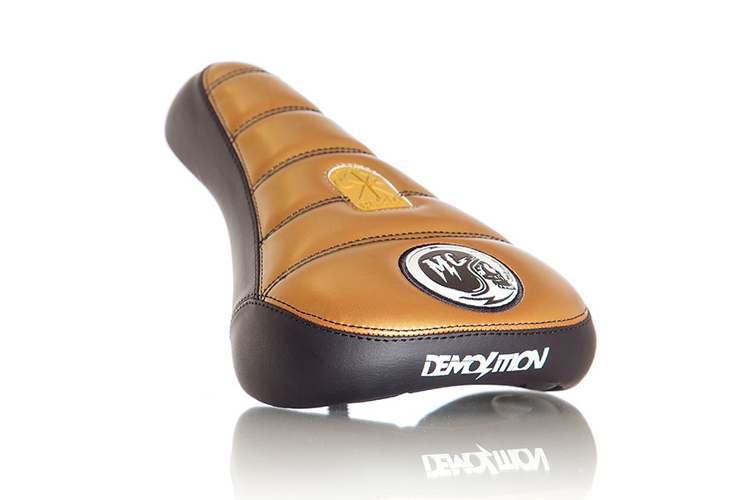 Get a look at the Matt Cordova signature MC Seat from Demolition Parts that now comes in a new Gold color! This Pivotal seat starts out with a Fat Capital base and padding, with Black Vinyl side panels and gold vinyl on top with matching stitching to give it a clean look. There’s also an embroidered Helmet / Skull logo and a screen printed Demolition logo on the back. The seat has a really cool motorcycle inspired look and this gold really gives it some extra pop. The MC seat is also available in an all black version if you aren’t feeling the gold, weighs in at 11.3 oz. with a $33.99 price tag. You can pick this seat up through BMX shops and mail-orders that carry Demolition Parts worldwide now! What do you think? Are you digging the gold? Let us know in the comments below! Not quite what you are looking for? Check out more BMX Seats! Demolition Parts have released Dennis Enarson’s new “CAPSLOCK” video and it is an absolute mind melter! HERE IT IS! DENNIS ENARSON‘S “CAPSLOCK VIDEO FROM DEMOLITION PARTS HAS ARRIVED! After a year and a half of going to work on stacking clips, Dennis ended up with over five minutes of absolute banger clips from spots around Southern California. Dennis promoised this was his best video part in a long time and it’s safe to say he delivered. Everything from the riding to the spots and film work are absolute fire. If you only watch one BMX video today… Hell, this week… Make it this one! Absolute must see. “Dennis has been hard at work on his CAPS LOCK video for over a year and a half and always wanted to try to outdo his last Demolition Last Chance video part and went all in to do just that. Every single clip in this is a banger and he could have died on doing each one. Dennis brings tech, big gaps, grinds and air tricks to the next level on street. Get a look at the new Kevin Peraza Signature KP seat from Demolition Parts! If you’re on the hunt for a new BMX Seat, the new Kevin Peraza signature KP Seat might just be what you’re looking for. The KP seat starts out with a black leather type top and black canvas on the sides, a leather patch with a KP Cow Head logo on top and a screen printed PerAZa logo on the back as a tribute to Arizona where Kevin is from. This seat is a Fat Capital Pivotal seat, so it has the patch with the Demolition logo up top and plenty of padding for sitting or pinching the seat for barspins. The KP seat comes in Black online, weighs in at 11.3 oz. and can be picked up for $33.99 through BMX shops and mail-orders that carry Demolition Parts worldwide. Don’t have a preferred dealer? You can also pick it up on the Demolition website as well! What do you think of Kevin Peraza’s new signature KP seat from Demolition Parts? Do you have any questions? Let us know what’s on your mind below! Not quite what you’re looking for? Check out more BMX Seats here!